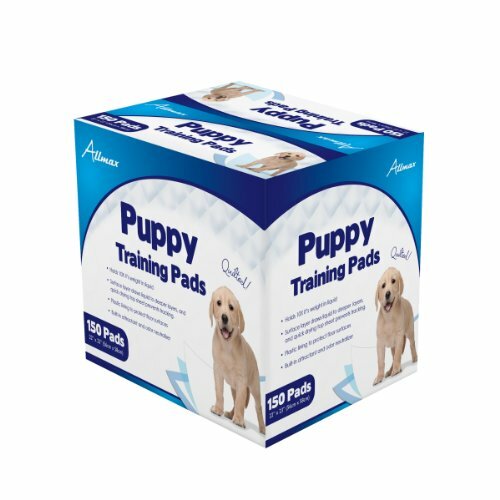 Cut your puppy's training time in half with these absorbent training pads. They hold 10 times their weight in liquid, making them a clean, sanitary solution for training puppies, assisting aging dogs, or housebound dogs when it's not possible to get outdoors several times a day. These absorbent pads accelerate housebreaking by giving your puppy his own place for "doing business," and offer benefits that newspaper and other pads can't deliver. Built-in attractant naturally interests your dog in the pad, while the odor eliminator prevents embarrassing odors. The quilted surface layer quickly draws liquid to deeper layers to lock in moisture, and the quick-drying top sheet keeps pup’s paws clean to prevent tracking. Plastic lining protects floor’s surfaces. By moving the pad closer to the door, your puppy will quickly learn to take his business outside. Give your family dog a jumpstart on training with these easily disposable, highly absorbent, anti-tracking potty pads. Pad dimensions are 22” X 23”. If you have any questions about this product by ALLMAX, contact us by completing and submitting the form below. If you are looking for a specif part number, please include it with your message.